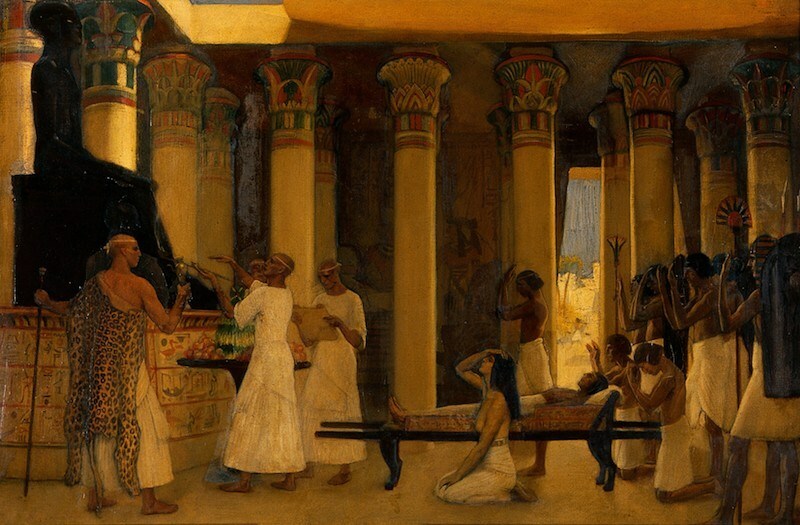 For the ancient Egyptians, religion wasn’t something they did once a week or on designated holidays. They believed that their deities were part of and responsible for all the natural forces around them. Those natural forces included the weather, the elements, animals, plants, and places. 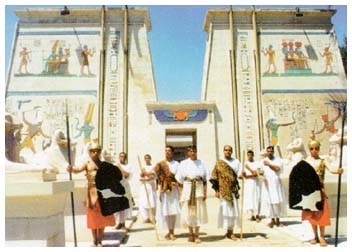 The ancient Egyptians worshipped or acknowledged over one thousand deities. Many of these deities were local to specific regions of the country, but many were universally known. As the Egyptians came in contact with other civilizations, some deities were added to their pantheon. Egyptian pharaohs were also routinely elevated to deity status, and particularly distinguished individuals were sometimes accorded that honor as well. Most religions have creation myths and the ancient Egyptians were no exception. They referred to this event as the Zep Tepi, which means “the first occasion.” Ancient Egyptian Zeb Tepi myths differ depending on the major city of a region, but they all have in common the idea that the world arose out of the primeval waters of chaos, personified by the god Nu. Another common feature is a pyramid-shaped mound, called the benben, which was the first thing to emerge from chaos. The sun was also intimately interwoven with creation, and it was believed to have first risen from the benben, personified by the overall sun god Ra or as the god Khepri, who represented the newly risen sun. There were many versions of the first appearance of the sun; it either emerged directly from the benben itself, or from a lotus flower that grew there, taking the form of a heron, falcon, scarab beetle, or human child. Another common variant of Egyptian cosmogonies, and those of other cultures, is the cosmic egg, which is either a substitute for the waters of chaos or the benben. One version of the cosmic egg variant has the sun god hatching from the egg created by the deities of the Ogdoad, or produced by the Chaos Goose and the Chaos Gander. The creation myth taught in the city of Hermopolis concentrated on the nature of the universe before the world was created. The substance and qualities of the primeval waters were personified by a set of eight gods, called the Ogdoad. The god Nu and his female counterpart Naunet represented the primordial watery abyss itself; Huh and his counterpart Hauhet represented the water’s infinite chaos; Kek and Kauket personified the primordial darkness within it; and Amun and Amaunet represented its hidden and unknowable nature. According to the myth, the eight gods were originally divided into male and female groups. As they dwelled within the primordial waters, they were symbolically depicted as aquatic creatures: the males were represented as frogs, and the females were represented as snakes. These two groups eventually converged, resulting in a great upheaval, which produced the benben. From the benben emerged the sun, which rose into the sky to illuminate the world. In Heliopolis, creation of the world was attributed to Atum, a deity closely associated with Ra, who was believed to have existed in the waters of Nu as an inert potential being. Atum started by creating himself, and became the source of all the elements and forces in the world. Atum then formed the air and wind god Shu and his sister Tefnut, goddess of moisture, moist air, dew, and rain. Next, Shu and Tefnut coupled to produce the earth god Geb and the sky goddess Nut, who defined the limits of the world between them. Geb and Nut in turn gave rise to four children, who represented the forces of life: Osiris, god of fertility and regeneration; Isis, goddess of motherhood; Set, the god of chaos; and Nephthys, the female complement of Set. These nine gods (and sometimes Horus) were grouped together theologically as the Ennead. The version of the creation myth found in Memphis centered on Ptah, who was the patron god of craftsmen. As such, he represented the craftsman’s ability to envision a finished product, and shape the raw materials to create that product. Memphite theology held that Ptah created the world in a similar manner. Unlike the other Egyptian creation myths, this was not a physical but an intellectual creation by the Word and the Thought of Ptah. The ideas developed within Ptah’s heart (regarded by the Egyptians as the seat of human thought, rather than the brain) were given form when he named them with his tongue. By speaking these names, Ptah produced the gods and all other things. This Memphite creation myth managed to coexist with that of Heliopolis, because Ptah’s creative thought and speech were believed to have caused the formation of Atum and thus the Ennead. Theban theology held that Amun was not merely a member of the Ogdoad, but the hidden force behind all things. Thebans conflated all aspects of creation into the personality of Amun, believing that he transcends all other deities. One Theban myth equated Amun’s act of creation to the call of a goose, which broke the stillness of the primordial waters and caused the formation of the Ogdoad and the Ennead. Amun was considered separate from the world, his true nature concealed even from the other gods. At the same time, because he was the ultimate source of creation, all the deities, including the other creators, were merely aspects of Amun. Due to this belief, and to the fact that Thebes was the capital of Egypt for such a long time, Amun eventually became the supreme god of the Egyptian pantheon, fusing with Ra to become Ammun-Ra. The ancient Egyptian view of the universe centered around Ma’at, a word that encompasses several concepts in English, among them “truth”, “justice”, and “order.” Ancient Egyptians saw Ma’at as the fixed, eternal order of the universe, both in the cosmos and in human society. They believed that it had existed since the creation of the world, and without Ma’at the world would lose coherence. Ancient Egyptians believed that the forces of disorder were constantly threatening Ma’at, and thus all of society was needed to maintain it. On the human level this meant that all members of society need to cooperate and coexist; on the cosmic level it meant that all of the forces of nature – which, for the ancient Egyptians, meant their deities – should continue to function in balance. This latter objective was central to Egyptian religion. The Egyptians sought to preserve Ma’at in the cosmos by sustaining their deities through offerings, and by performing rituals that forestalled disorder and perpetuated the cycles of nature. The most important aspect of the ancient Egyptian view of the cosmos was the way they conceived of time, which was extremely concerned with the maintenance of Ma’at. Throughout the linear passage of time, a cyclical pattern recurred, in which Ma’at was renewed by periodic events that echoed the original creation. Among these events were the annual flooding of the Nile, and the succession from one king to another – but the most important was the daily journey of the sun god Ra. When pondering the shape of the cosmos, the ancient Egyptians saw the earth as a flat expanse of land, personified by the god Geb, over which arched the sky goddess Nut. Shu, the god of air, separated these two deities of land and sky. Beneath the earth was a parallel underworld and undersky, and beyond the skies was the infinite expanse of Nu, the chaos that had existed before the creation of the world. 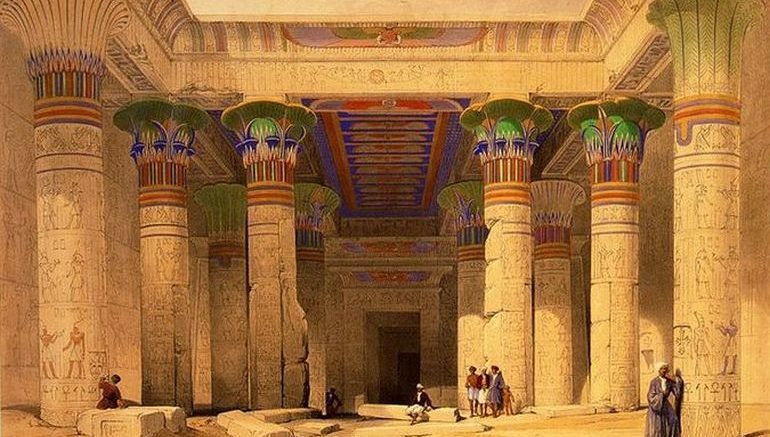 The ancient Egyptians also believed in a place called the Duat, the land of the dead, which was located either in the underworld or in the sky. Each day, Ra traveled over the earth across the underside of the sky, and at night he passed through the Duat to be reborn at dawn. In ancient Egyptian belief, the cosmos was inhabited by three kinds of sentient beings. The first were the deities; the second were the spirits of deceased human beings, who existed in the divine realm and possessed many of the deities’ abilities. The third were living humans, and the most important among them was the pharaoh, whose role was to bridge the human and divine realms.